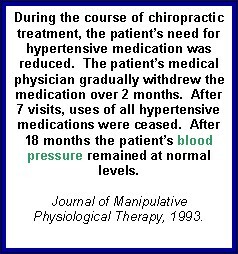 Do Chiropractors Believe in Medicine? Well, I can’t speak for all chiropractors, but for me…this question is an easy one! I absolutely believe in medicine and surgery. BUT…only when it is NECESSARY!!! 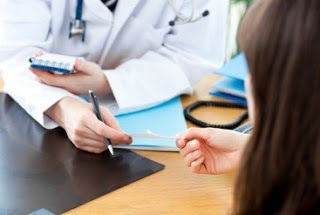 These days, prescription medications are thrown at patients by medical doctors because medical doctors have no other means of treating the condition. In my opinion, pharmaceutical companies run the medical industry. Is that good for patients? Absolutely not! But that is how pharmaceutical companies make their money…by keeping patients sick. Surgery is not much better. If you go to a surgeon, they are more times than not, going to tell you that you need surgery. It’s what they do!!! So many people are on medications to treat the side effects of the medications they are on. It is a vicious cycle. Most medical conditions that people are taking medications for can be treated with healthy diet, exercise, and believe it or not…chiropractic care! High blood pressure, high cholesterol, heart disease, obesity, fatigue, type II diabetes…the list goes on and on. All of these disorders are often caused by poor diet and lack of exercise. Now, I do know that genetics can play a role in the predisposition of disorders like these…but that genetic predisposition does not mean you WILL get the disorder. 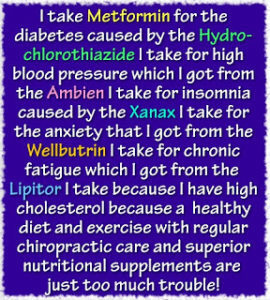 Wouldn’t you rather alter your diet and exercise a few minutes a day and be healthy, than rely on chemicals (medications) to run your body and have to deal with the horrific side effects? Chiropractic care promotes a healthy and well-balanced lifestyle. Not to mention that receiving consistent chiropractic adjustments has been shown to reduce blood pressure, signs of asthma, and ear infections. Plus…it can help boost your immune system by clearing out any pressure on your nervous system! 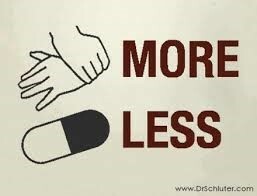 Medications are absolutely necessary for some situations, though. Take an infection for example. Chiropractic cannot destroy the bacteria or virus causing the infection. Antibiotics or antivirals are needed to control the infection. Another example would be cancer. Chiropractic cannot destroy the cancer cells invading the body…chemotherapy and/or radiation is needed for that. But things like cancer and infection are caused by toxins from outside the body. High blood pressure, high cholesterol and type II diabetes are usually caused by toxins from inside the body…toxins from eating unhealthy foods or toxins that are not released through exercise. Surgery is the same way. Sometimes surgery is absolutely necessary…and sometimes there are other routes to try first. Surgery to repair the effects of trauma, organ transplantation, or in emergency situations is, of course, necessary, but back surgery or carpal tunnel surgery is not always needed. In a 2010 study, 74% of back surgeries failed, meaning the pain felt before surgery was still present afterward, or the surgery did not accomplish what it was supposed to. Often, conservative care for back pain, and even carpal tunnel syndrome, is more effective than surgery…especially when treated early enough. In summary…I personally believe that medications and surgery have a need and a purpose. But I do not believe they are the end all, be all in medicine. Chiropractic care can help with so many different issues, injuries and disorders that it cannot be forgotten or overlooked when searching for a treatment option. The doctors at Pro Chiropractic are all well trained and passionate about helping their patients by drilling down to the cause of the problem and not just treating the surface symptoms.